A perfect size to put in your backpack! A book the whole family will enjoy. The Danny Cool Books are a series of French Story Books for learning French. Our books feature simple French text that is ideal for beginners of any age. A book the whole family will enjoy! 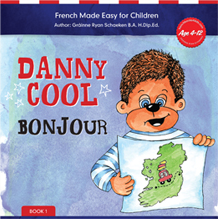 In this first book “Bonjour”, set in Ireland, Danny Cool introduces himself and his fun loving family. Author Gráinne Ryan has over twenty year’s experience teaching French and has lived and worked in both France and Belgium. Teaching small groups of Primary School children made her realise that there was a real need for French reading books, aimed at English speaking children. From this first hand experience the idea of Danny Cool was born.